If you are looking for a professional Massage Therapist or Hypnotherapist in Georgia you have come to the right place. Melissa Upham - Strickland is an Integrative Massage Therapy practictioner as well as a Certified Clinical Hypnotherapist, Neuromuscular Therapist, Myoskeletal Alignment specialitst, Reflexologist, Energetic Practitioner, Reiki Master and Certified Wellness Coach. Sessions with Melissa are dedicated to healing your Body, Mind & Spirit. Designed to create a more personal, interactive experience to suit your individual needs at the time of services. 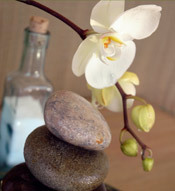 Specializing in medical & rehabilitative Massage/Hypnotherapy practices with preventative care. I look forward to being a part of your health and wellness program! "If it hurts, it needs work!" I am trained in a variety of modalities, with over 25 years experience in hands on healing techniques. I have a passion for helping others achieve their goals in health and wellness. I will do all that I can from my well of knowledge to help you gain greater insight into your Body, Mind & Spirit connection. My philosophy is that in helping others we learn and grow mentally, spiritually and emotionally and therefore help ourselves! My goal is to empower others by helping people to help themselves! You can click on the "My Services" page to learn more about the various techniques I use in my work. Milledgeville or Greensboro & Lake Oconee Georgia!